I used both Aqua promarkers & Promarkers for this one, yep, they work well together, heat set the outline image stamped with aqua markers and then colour with promarkers & no bleeding-brilliant! Stamp from hero arts, ribbon from stash, cardstock DCWV, punch from stampin up. I have a card to share, a giveaway and news of a fab challenge prize up for grabs.... happy days for all crafters! First up I have a Luke & Lola Memory Box Kit on offer - click here for details of the kit, this is from my personal destash/spring clean. It's absoloutely FREE to one lucky person leaving a comment between now and the 30th April when I'll pick a random winner. Just one rule... please include 'MBK' somewhere in you comment if you want to be in with a chance of winning. Next up here is my take on this week's challenge over at Skattykats which is a colour challenge. There is a fab set of Hobby ProMarkers up for grabs, so to be in with a chance of winning them be sure to join in with their weekly challenges from now until the 28th of April. Hero Arts Wallpaper Flowers stamp, stamped with Brilliance graphite black, coloured with Tria Markers and accented with stickles glitter glue in turquoise. Kraft coloured card blank from ages old stash - (soz, not sure where from) Sentiment Hero Arts Anytime Messages stamped with black versafine. Buttons from Skattykats (one coloured with green tria marker ;) Embroidery thread DMC. Punched Border from Bazzill Swiss Dots 'slipper' Border Punch from Stampin Up. Today I'm trying to get my crafty hoards organised which is no mean feat for me as I'm domestically challenged - being neat & tidy is not one of my strongest points! I somehow got sidetracked (as I do!) and decided to do the flutterby pic again, this time in blue with the flutterby a little smaller. I also changed the original pic as I like the smaller size in the frame, personally I think it looks more balanced. I used rangers distress ink in weathered wood for the background this time around. I only have a pic of the blue one today as my photo software has decided to play silly & refuses to work properly so apoligies for the poor quality pic! 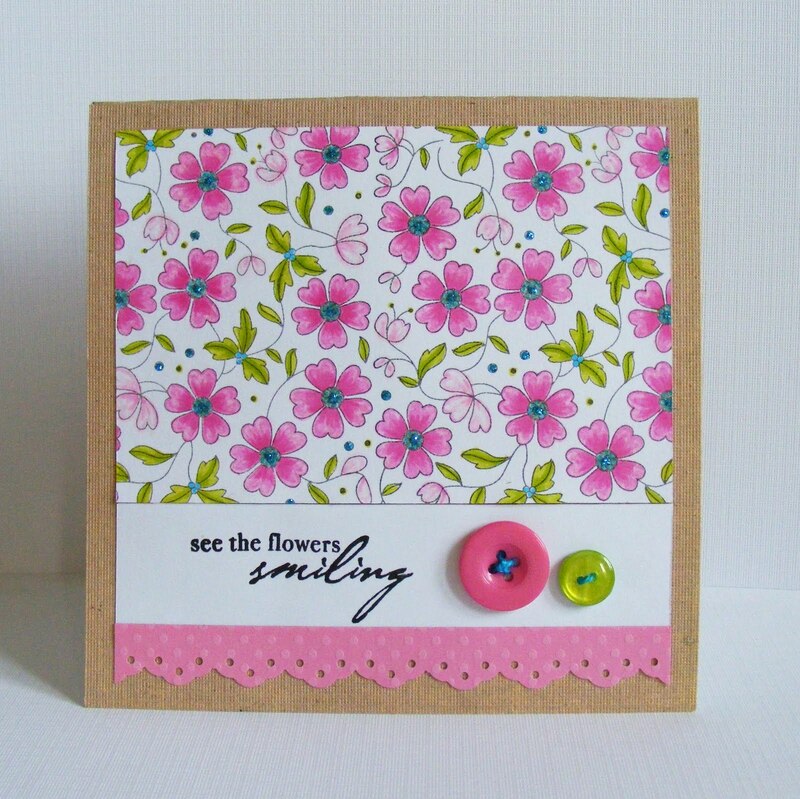 Can't wait for my stuff to arrive, I must confess my fondness for HA stamps borders on obsession! 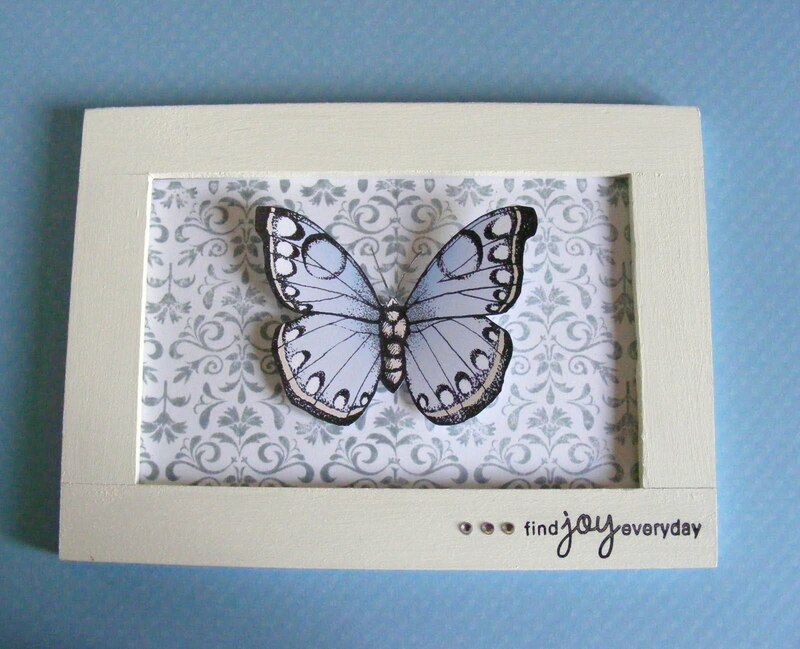 Wednesday has come around quickly again and it's time for another challenge over at Skattykats which is to make anything as long as it's NOT a card. It's made from a cheap Ikea frame, painted white. 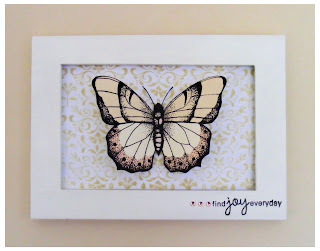 The background was stamped with Antique Linen distress ink with Hero Arts 'Antique Brocade' stamp and the butterfly is part of Hero Arts digital kit 'flutterbies' the sentiment was stamped in black ink and is from HA 'Anytime Messages.' I added three small crystals to finish. Methinks I will do a few more of these, maybe with a different butterfly image and change the background colour. I'll share if I do. Hope everyone is enjoying the Easter break. I'm on a real flyer... kids are off school and too much to do and so little time. 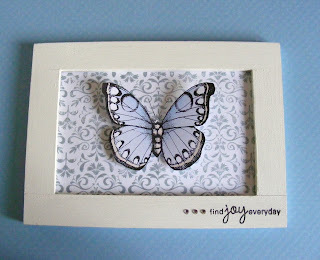 Here's my card for the challenge 'Wing it and Bling it' at Skattykats There are some doodlebug paper frills up for grabs. To be in with a chance to win them, just join in with the challenge over there. Sorry about the poor pic, I did'nt have time to wait for the glitter to dry properly so it looks a bit ropey - ooer! 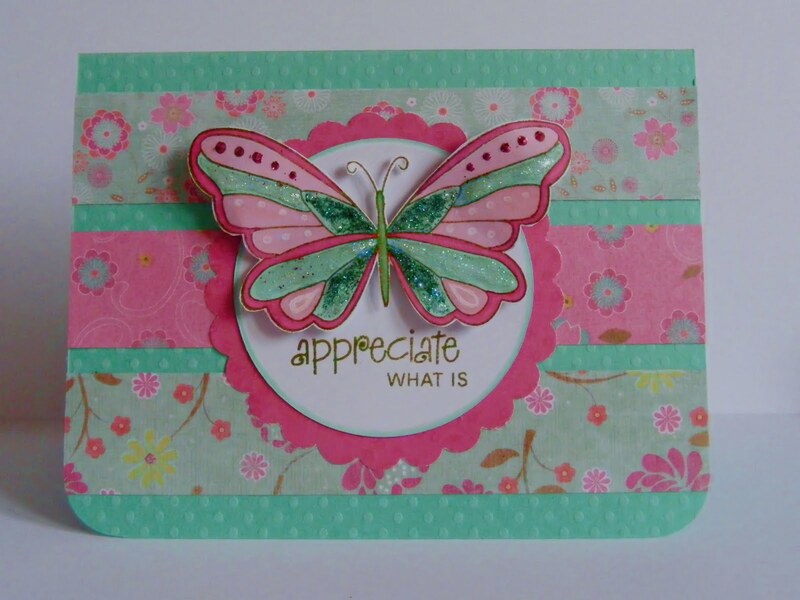 Supplies: hero arts clings - 3 butterflies and clear design - anytime messages, MME freebie mag papers, stickles, promarkers & swiss dots bazzill cardstock. 3" woodware scallop, circle punch, fiskars shape cutter and circle template.